The Soundcake speaker offers wired as well as wireless Bluetooth connectivity. The speaker weighs 412 grams and is backed by a 2600mAh battery. Portronics has launched its latest wireless speakers, the Soundcake priced at Rs 2,999. 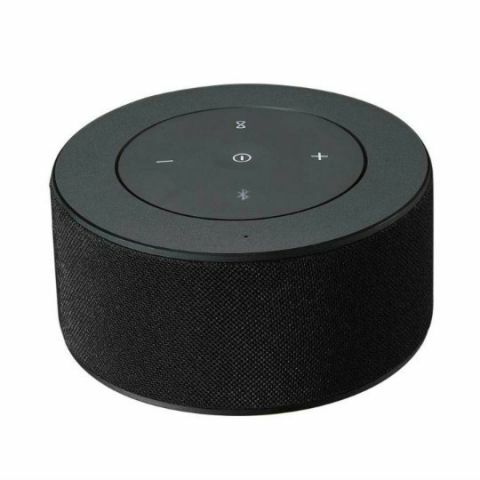 The speakers are Bluetooth enabled and feature a True Wireless Stereo (TWS) feature that allows users to pair two Soundcake speakers for a stereo effect. The company claims that the speaker can be fully charged under 2 hours and can last for over 8 hours on a single charge. The Soundcake is available in jet black colour via both online as well as offline retail stores all across India. Portronics, a highly trusted name in field of Innovative & Portable Digital Devices and Gadgets, is proud to launch a High Quality and Extremely Versatile Re-Chargeable Stereo Speaker with TWS Technology “SOUNDCAKE” – which is much more than just a stereo speaker. The most awe-inspiring part of this amazingly stylish audio gem is its TWS feature that enables you to connect two SOUNDCAKE speakers via Bluetooth 4.1 and create a wireless stereo Left Channel and Right Channel, so you can have a true stereo sound effect in a flash. You can play great quality music or watch HD movies with equally great sound from your smartphone, tab, laptop, computer and iPod (using AUX cable where Bluetooth is not an option). Your favourite music or movies are best enjoyed with true stereo speakers. However most stereo systems are not portable. That means you are not able to carry them around from one room to another or in your car. At the same time, most portable systems are not true stereo systems because of their size and portability. The versatile SOUNDCAKE bridges this gap of STEREO Vs PORTABILITY with style. It allows you to connect your music sources through Bluetooth or AUX cable. You can very simply connect two SOUNDCAKES using TWS technology and connect one of the SOUNDCAKE with your music source. You can very well buy a single SOUNDCAKE as it can work very well in standalone mode too. SOUNDCAKE also gives you great convenience of hands-free phone calls. With in-built mic and speakerphone facility, you can take/reject/end calls coming to your smartphone. You can end or deny calls very easily and continue with your favourite songs without missing a note. A single SOUNDCAKE offers two powerful 5 W inbuilt speakers with great amplifiers to offer fantastic surround sound output. It has powerful metal grill body of around 412 grams which packs the punch across the audio spectrum. The powerful industry-leading size of 2600mAh lithium Ion battery can play music for more than 8 hours on a single recharge. The battery can be recharged in just around 2 hours. Battery indicator LEDs make it easy to know the battery charge status. All this makes it a very compact and highly portable system. The new Portronics SOUNDCAKE is available in jet black colour at a price point of INR 2999 only. It is available both online as well as offline retail stores all across India.